Since I started sharing my Bullet Journal in 2016, I’ve gotten so many questions about the pens I’m using to create my headers. I’ve also been asked many times if I’ve been formally trained or taken any courses on hand lettering. Well, today I’m going to give my readers the goods — the juicy secrets of hand lettering success (if there is such a thing). The truth is, I’ve never taken a class or a course. I’ve never picked up an instructional book or so much as glanced at a practice sheet. (Not that I’m against them. Now that I’m in love with lettering, I’d happily while away the hours doing drills on practice sheets.) Planning every day in my bullet journal has been the only practice I’ve indulged in, though, granted, every day is a lot. And you know what? When I first started out I really wasn’t that great. I had the basic cursive skills of a high school student. Here’s a peek inside my very first bullet journal. As you can see, I’m clearly no expert. I’ve made a lot of progress since those early days. How did I do it? I wrote every day and I finally found the right pen. It’s that simple. You don’t have to devote a lot of extra time and money to improve your handwriting. I’m going to show you the pens that made hand lettering and calligraphy easy for me, and the one tip that changed the game. The act of writing every day — with the right pen in your hand — will make you a hand lettering rockstar in no time. This tip changed the game for me. It’s so obvious that you’re thinking, gee, Sheena, did you really not get that immediately? If this is you, I praise you for your intelligence and I’m glad we’re friends. But no, I really didn’t understand this basic principle and when I did; mind=blown. Really, that’s it. When I understood that, I understood what my hand was doing wrong, and why my writing didn’t have the professional feel that I saw in others. This is easy to implement into your writing. Use little pressure on the way up and more pressure on the way down. This technique is why brush pens are the favorite for calligraphy. They give a very satisfying, thick downstroke. What does that mean? Make sure your letters are spaced evenly. The space (kerning) between each letter should always measure the same. It doesn’t matter whether your handwriting has your letters close together or far apart, as long as the distance is consistent. The same goes for the size of your letters. Whether you write big or small, make sure all of your uppercase and lowercase letters are the same sizes. This is the number one thing you can do to improve your everyday handwriting even with the most basic pens. Changing this will make your grocery list look like a love letter. This is my most favorite pen of all time. I want to be buried with this pen. Too dramatic? Yes. But I’m almost not kidding. Even if I hadn’t practiced the tips above, this pen teaches your fingers what to do just by the way it naturally writes. I can’t recommend it enough for anyone interested in hand lettering and calligraphy. It comes in a hard tip and a soft tip, often in the same pack. I prefer the soft tip because I love some thick downstrokes, but the hard tip is better for more precise work. The best part? A pack of 2 starts at just $5! So a cup of fancy coffee or calligraphy heaven? I trust you’ll choose wisely. Tombow is a real workhorse of the calligraphy pen community. For instance, the Dual Brush Pens are a standard and are often the pens used to create those fancy hand-lettered inspiration quotes you can buy on Etsy. They are bigger and thicker than the Tombow Fudensuke and so require a little more practice to get the hang of. But they are still easy to use and once you master them they make a big impact on the page. These come in a wide variety of colors and saturation, so there’s no end to the calligraphy art at your fingertips. What am I? Three years old? I know, right? You’re probably thinking, doesn’t my kid have these in his backpack? They might, but if you’re a beginner, these elementary school favorites really can help you hand letter like a rockstar. Just remember the first principle: thin up, thick down. You can also think of it this way: light-handed up, heavy-handed down. 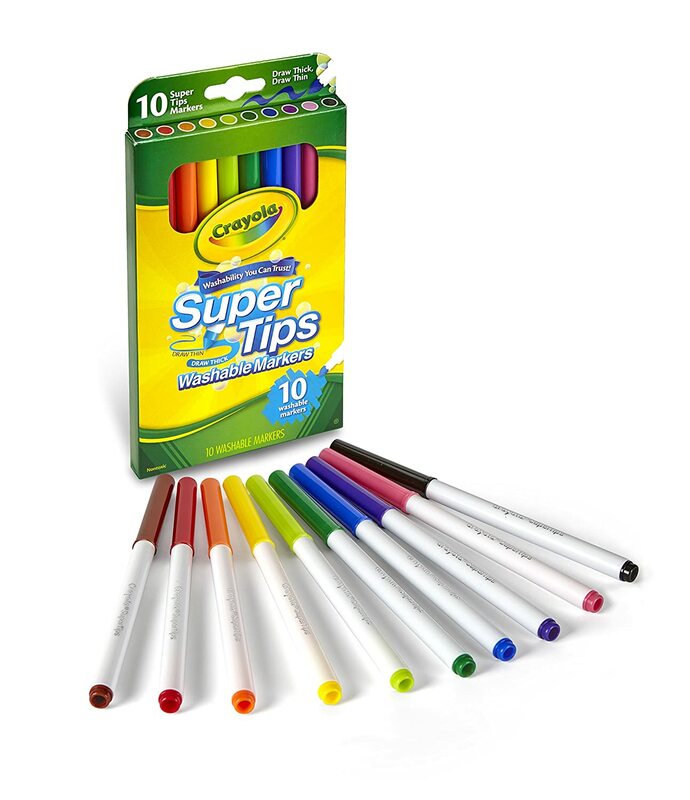 When you apply that technique to Crayola Super Tips, you’ll be surprised at the beautiful result. And of course, these babies also start at just $5 for a pack. You have lots and lots of crazy colors to choose from! If you’re looking to improve your handwriting the easy way, I hope you’ll give this a try! Remember, practice really does make perfect, but it doesn’t have to be extra work. When you incorporate writing into your everyday life — whether it be through your Morning Pages, a Bullet Journal, or just perpetual list making — you take the drudgery out of daily practice. Looking for more tips and tricks on great hand lettering? Check out the brush lettering guide — how to easily blend colors!